Goals from Sadio Mane, Philippe Coutinho and Divock Origi earned Liverpool a 3-1 Merseyside derby victory over Everton at Anfield on Saturday afternoon. Brilliant individual efforts from Mane and Coutinho in the first half, along with Origi’s powerful strike on the hour mark, saw the Reds move up to third in the Premier League by completing the double over their neighbours this season. Everton had briefly drawn level through Matthew Pennington following Mane’s early opener, but Coutinho responded immediately to make sure the hosts went in ahead at the interval. Mane was forced off with an apparent ankle injury soon after half-time - however, Origi, the No.19’s replacement, sealed all three points for Liverpool with a fine finish just minutes after coming on. Mane gave Liverpool an early lead. Pennington equalised in the 28th minute. 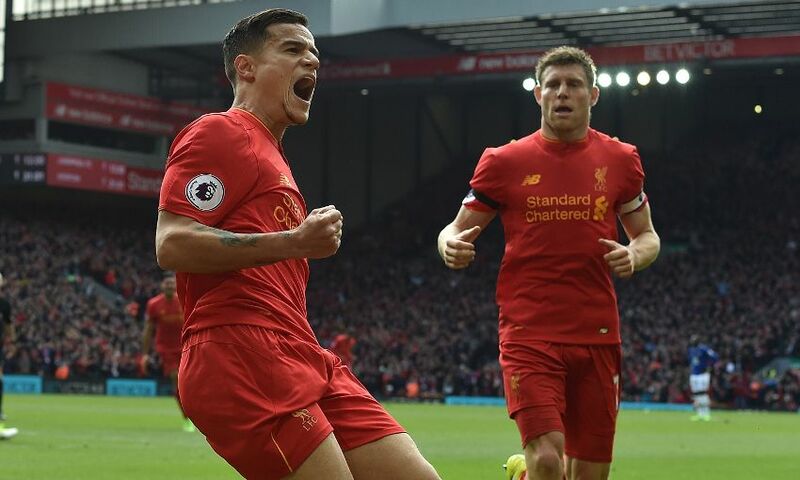 But Coutinho restored the Reds’ advantage almost immediately. Origi, on for the injured Mane, made it 3-1 on the hour. Victory lifted Liverpool into third in the Premier League. Jürgen Klopp made two changes to his starting line-up from the 1-1 draw with Manchester City a fortnight ago, with Lucas Leiva and Dejan Lovren coming in for Adam Lallana and Ragnar Klavan. Marko Grujic, meanwhile, was named in Liverpool’s squad for the first time since November following a tendon injury. Following a poignant tribute to ‘Mr Liverpool’ Ronnie Moran before kick-off, the derby began at a predictably frenetic pace. But amid the fast and furious tempo, Mane produced a moment of calm and clinical quality to open the scoring eight minutes in. After spinning away from Idrissa Gana Gueye just inside the Everton half, the Reds’ No.19 played a neat one-two with Roberto Firmino and carried the ball across the face of the area before whipping a left-footed shot back across Joel Robles and into the far corner. The decibel level inside Anfield went up a couple of notches, and only a combination of Robles and Phil Jagielka prevented Coutinho from doubling Liverpool’s lead in the 19th minute. Coutinho was freed down the left by a lofted pass from Emre Can. The Brazilian jinked inside onto his right foot, but saw Robles parry his shot high into the air, allowing the covering Jagielka to clear off the line. Everton were level shortly before the half-hour mark when Pennington pounced on a loose ball from a corner and converted from close range - but their parity lasted just three minutes with Robles, this time, unable to do anything to deny Coutinho. The No.10 dropped deep to pick up the ball and drove at the heart of the Blues’ backline, took a step inside and curled an unstoppable right-footed effort beyond the despairing visiting goalkeeper to ensure Liverpool went in ahead at the break. No sooner had Origi replaced Mane, the Belgian gave the Reds a two-goal cushion on the hour. Taking no time at all to get up to speed with the game, Origi cut in from the left and powered a right-footed shot past the wrong-footed Robles and high into the Kop-end net. Simon Mignolet reacted quickly to palm away a deflected shot before Dominic Calvert-Lewin nodded over as the Blues went in search of a quick response to Origi’s strike. But Liverpool retook control of proceedings and Trent Alexander-Arnold, making his debut in the derby at first-team level, twice forced Robles into saves after being introduced for Coutinho as the Reds saw out the closing stages in relative comfort.